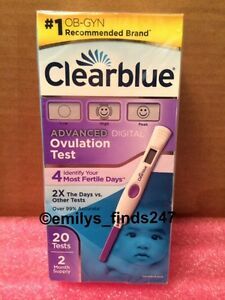 Keep track of your cycles simply and privately with the Clearblue Fertility 20 Advanced Digital Ovulation Test. This product gives you trustworthy results while the instructions are easy to follow and ensure accuracy. It has a simple-to-read digital bar and provides results for two different fertility hormones. The Clearblue Ovulation Test boasts 99% accuracy even for women with irregular periods. Directe betaling van US $29,49 is vereist.